Many of us make and break resolutions for New Year’s. But when it’s for your health, you want to make sure you follow through. 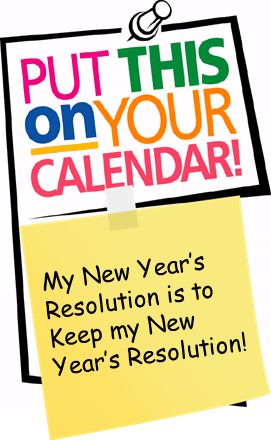 Make your health a priority resolution, because without it you cannot achieve your other resolutions. Keep your goals down to Earth and attainable. Swearing off guilty foods you love isn’t going to work, for example. Telling yourself to eat it once a month, however, is easier to keep. Instead of promising to work out an hour or two a day, just promise that you’ll work out daily. A couple hours may be too much at first, but making sure to exercise at least each day. Planning to diet and exercise should be done well in advance of New Year’s Eve. If you just make the resolution without thought and plans, you’re likely to not be committed to the idea. Have plans set so you won’t skip the gym. Make sure to strictly plan on when you’re allowed to enjoy a guilty food. Join friends also looking to diet and exercise and build a support team. Think positive and keep practicing it. Focus on your goal and remember how badly you want to reach it. Posting a page on the wall may help you keep motivated. Ask people for honest opinions of what you need to change and what about your health is fine. Take the list to your gym or put it in your workout room. Ask your family and friends that are supportive to help you stay on track with your goals. Real friends enjoy pushing their friends forward in life. Don’t suddenly binge on guilty foods, but allow yourself a small treat now and then. Mind you, a reward can be just about anything. It does not have to be food. Having shorter-termed goals within the grand plan is an awesome way to keep yourself feeling positive with each accomplishment. Write down your accomplishments after you achieve them. Losing 2 pounds in one week and 3 in the next, for example, is one decent goal. Everyone potentially may slip up but you just have to let go of any frustration you may have from it. Push on and keep doing your best. Be patient with everything. Everything should become a habit in about 3 weeks, while it may take months for it to feel like a part of you. Sometimes it may feel easy to give up. When you feel like this, tell yourself again that the goals you want to achieve in the end is really what you’d be happier with. Don’t back down from your own challenge.